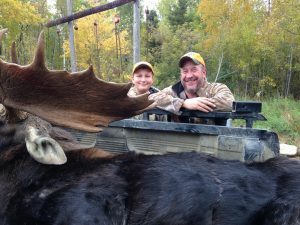 If you call and schedule a hunting trip with Big Machias Lake Camps, LLC dba: Oxbow Outfitters, LLC (BMLC) you likely won’t notice a difference because Jeff Lavway, the new owner of BMLC, is the same person who has been managing the day to day operations of the business for the past two years. On May 30th, Lavway officially purchased the business from Jeff O’Connor of Pennsylvania. Lavway has worked as a licensed Maine Guide since 2005 operating his own company, Northern Experience Guide Service in Gardner Creek from 2005-2013. Upon selling his business Lavway went to work for BMLC, starting out as a guide and expanding his role each year until 2015 when he took over the operation of the business. In the industry, BMLC is well-known as it has been around since the mid 1920’s. The business started out as a logging camp and transitioned to sporting camps in the mid 1960’s. Hunters and avid sportsmen travel from all around the United States and Canada to enjoy this tranquil piece of Northern Maine. Today BMLC has a total of 7 camps that sleep a total of 33 people. The company also has exclusive rights to 238 lease sites covering over 757,000 acres within the North Maine Woods. In addition to guided and unguided bear hunts, Lavway also provides moose hunts, deer hunts, bird hunting, and various types of fishing year-round. Once he decided to pursue the purchase of the business, he was referred to Northern Maine Development Commission (NMDC) where he worked closely with Josh Nadeau of the Maine Small Business Development Centers to develop an attractive business plan. Lavway knew the business was profitable, but to determine the business’s full potential, he sat down with Nadeau and worked through a 12-month cash flow projection over the course of a few meetings. “The assistance I received from Josh really helped me to put numbers on paper and test the feasibility of my idea,” he added. After working with Nadeau, Jeff worked with NMDC to secure the funding which would make this business transaction possible. For more information on Big Machias Lake Camps, visit the website at or visit their Facebook page.